A. Lange & Söhne has had a meteoric rise since the 90s when it launched the Lange 1. This of course isn't when the brand formed, which was in 1845, but when it began to stand with the top brands in haute horlogerie (super fancy watches). It became the poster child of the in-house manufacture and has since been the darling of most watch publications. For good reason. I feel that A. Lange & Söhne presents the classic dress watch in an updated, but still understated manner. Its base model, the 1815 Saxonia, has more details and visual interest than a base model Patek Phillipe or Vacheron Constantin, while delivering on the German promise of fine engineering. With its other German friends, Nomos Glashütte and Glashütte Original, Swiss watches have had the first real fine watch competition in some time. With many more complicated models in its lineup and stunning pocket watches in its past, the prices for its timepieces quickly climbed to well over six-figures. One of my favorite things to do when cruising the watch markets is type in a high end brand, like 'A. Lange & Söhne', into the Chrono24 / Watchrecon / eBay search box and sort by price, lowest to highest. Like many other times, I came upon a unique find today. A German watch seller had this Lange Chronograph listed, with a recent documented service from A. Lange & Söhne - she's from the 70s, and what an interesting piece! With a Valjoux 726 movement, plexiglass domed crystal, full chronograph register and a wonderfully balanced dial, this is exactly the sort of thing that is a great addition to a chronograph collection. Similar to the Omega Speedmaster and Ulysse Nardin chronographs of the same time, Lange has taken a stab at a tool watch with fantastic results. Plexi crystals are always cool. Highly readable dial and useful chronograph function. The 12, 3, 6 and 9 hour markers in a different shade of tritium. Fantastic price point for such a rare piece in mint condition. Are you cool with rectangular watches? Think the JLC Reverso is too low brow? Well, a seller on Chrono24 is currently offering this little stunner, which might be of interest to you. Red gold is a great looking metal. Big date display, Lange's landmark feature, two big french doors chock full of date. Display back to see the stunning 3/4 plate movement with hand carved swan's neck regulator. Roman numerals and a generally fantastic art deco face. It is a bit of a unisex size at 25.5mm wide and 36mm tall, maybe save this one for a lady in your life. Like the Vacheron Constantin Patrimony or Patek Phillipe Calatrava, this is the classic three hand Lange. Sporting a gorgeous sapphire crystal on the back, you can enjoy the movement ticking away, or just stare at the Geneva striping on the main plate peppered with rubies and blued screws. While it may be the entry level model Lange makes, it is no less an impressively crafted and tested piece than their pricier offerings. Simple yet somehow modern and visually interesting dial. 37mm case wears larger due to the vast dial and large hands. The way the logo rides the shape of a rainbow. The curved lugs that hug the wrist like a dream. 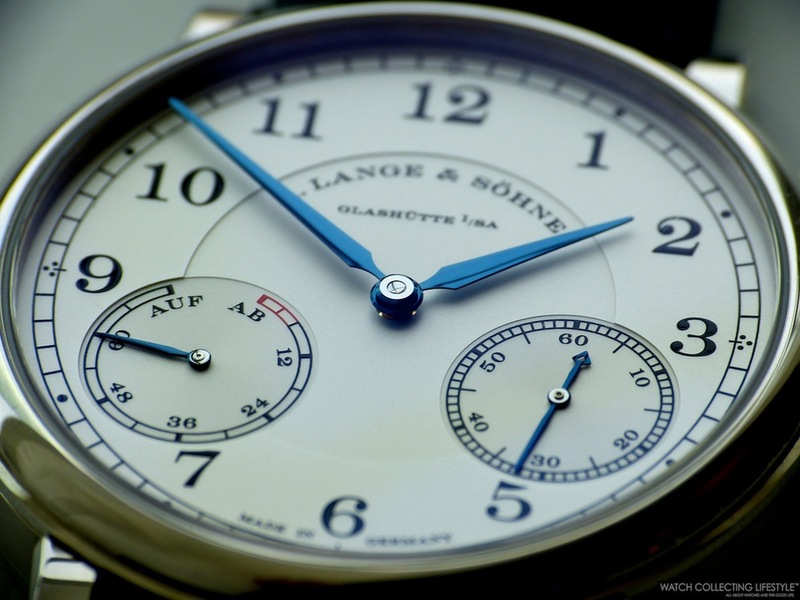 Like most German companies during WW2, A. Lange & Söhne was required to produce products for Nazi Germany. As someone of Jewish descent, I would never encourage the purchase of Nazi branded memorabilia, but these watches have no Axis markings. In fact, many of these items had their outward manufacturer branding removed, which left a supreme tool-watch like quality with incredible engineering under the hood. As the first entrants into the Flieger category, these watches have so much history that I'd be remiss not to mention them. In addition, they are relatively affordable for A. Lange & Söhne and are very rarely in good condition after over seventy years. Defined an entire category of watches called Fliegers. Huge even for today's standards at 55mm, truly a 'Big Pilot'. Not having logos on the dial shows off its tool function. The yellow cream patina on the hands. The blued sword hands which likely influenced the Rolex Mil-Sub. More information about the history of these Fliegers can be found here. Again, putting aside the awful surroundings during which these stunning pocket watches with a power reserve complication were produced (Nazi Germany), if you like the idea of adding a pocket watch to your collection, this would make an excellent one. Although Lange didn't invent the power reserve, a complication credited to Breguet in 1938, it certainly made good use of it. If you love the newer A. Lange & Söhne 1815 Up/Down, this would be a way to enjoy its history in a much larger case (58mm!). Both Bonhams and Chrono24 have some of these rare clocks on offer in great shape. Note: Some of these pocket watches actually do have A. Lange & Söhne written on the dial, which may have been post-war products, but I couldn't find anything specifically addressing this detail.